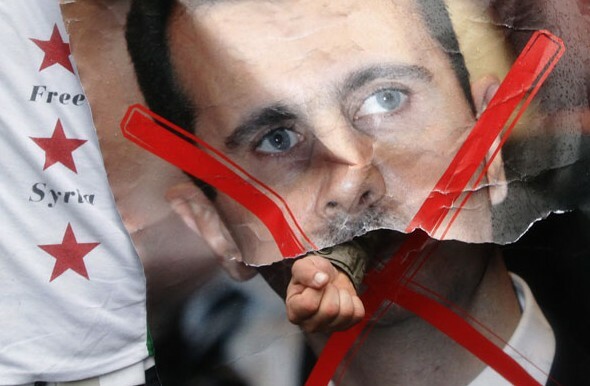 Word came this weekend that “rebels” in Syria were fighting government forces in Damascus. This is obviously quite significant, since dictators caught in their own capitols often don’t fare well (see Hitler, Adolf). Many have wondered why Obama and NATO haven’t intervened/interfered in Syria, as they did in Libya (and, indirectly, Egypt). We can only speculate, but a clue lies in the geo-political situation in Libya, ruled with an iron fist by Muammar Gaddafi. The cartoonish Libyan was more like a tribal chieftan, and his loyalists would have held out much longer against the Muslim Brotherhood-inspired “rebels” fighting against Tripoli...had not NATO and Obama been so hell-bent on removing Gaddafi. Hauled-out and shot, Mussolini-style, last October, Gaddafi passed from the scene as a chilling Muslim horde moved across the sands of the Middle East. In Syria, however, Bashar Al-Assad (himself a mass-murderer) is more of a secular autocrat whose loyalists make up only about 10 percent of the population. Assad, an Alawite (a branch of Islam) who, perhaps surprisingly to many, has been relatively easy on Syrian Christians, has been allowed to continue in power—savagely murdering his own citizens in the year-long uprising—because, in my opinion, he was going to fall without Western intervention. If he killed 10,000 men, women, and children, well, tsk, tsk. Gaddafi had to be removed much more quickly in order for the Brotherhood to come to power. In Syria, once the inevitable happens and Assad is strung up by his heels, the conditions will exist for the Muslim Brotherhood to rule that country. We know where that leaves Israel. No matter who lands in power in Syria, Russia intends to be a player for the duration. Interesting, in light of Ezekiel 38,39. Because Assad was similar to Hosni Mubarak of Egypt, Jordan’s King Abdullah and, to some extent, Saddam Hussein, he was content to be a menace to Israel, but not a lethal threat. The new rulers of Middle East countries will be much more like the Iranian mullahs—religious psychopaths who do have lethal intentions for Israel. The passing of the Assad regime in Damascus provides the framework for the next rulers to unwittingly bring Isaiah 17 to pass.